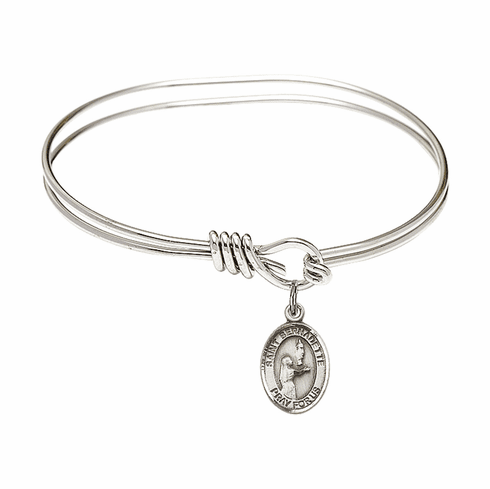 These beautiful patron saint sterling silver or 14kt gold-filled charms come on a round double Eye Hook bangle bracelet. Choose from a rhodium-plated bangle with a sterling silver charm or a Hamilton gold-plated bangle with a 14kt gold-filled charm. The silver bangles are rhodium-plated, which is a precious metal that is bright, durable and guaranteed not to tarnish with a sterling silver charm. The gold round double Eye Hook bangles are made with Hamilton gold, which is plated in rich gold and compliments our new 14kt gold-filled charms. All handcrafted religious bracelets are made in the USA by Bliss Manufacturing and come in a nice gift box. They make wonderful birthday, just because or First Communion gifts.